An abridged version of this essay was read at the Reform Club on the evening of November 23, 1999; the whole essay has been published in the February 2000 Trollopiana. The purpose of this publication is to make the essay widely available with all the scholarly notes. Good Evening, ladies and gentlemen. I have come here tonight to describe to you a strange element in the nature of Anthony Trollope's story-telling art. His novels are stuffed with imaginary letters. Chock full. So many that our story-teller cannot include them all: no, he summarises, paraphrases, and quotes epitomising snatches. Some he throws into free indirect speech in which he combines his characters' thoughts with his own. When it is to his purpose, though, he fills whole chapters with letters, and labels them with titles like 'The Stanbury Correspondence'. When it is important that we keep the order the letters were received, read, and answered clear, he numbers them for us. He will encapsulate in a single letter or a summary of lengthy correspondence episodes lasting several months or a few years. One lone letter can initiate a crisis in a novel; another, a novel's central story. Critics have quoted and discussed individual letters as examples of Trollope's virtuoso impersonation. Such quotation usually appears as part of a thematic discussion. Their excuse: the letter is just too good to ignore. David Pearson has carefully examined the large number of letters in one of Trollope's short novels, Sir Harry Hotspur of Humblethwaite. From it, Pearson generalises: 'Trollope is easily the most epistolary of non-epistolary novelists'. Alas, one swallow does not a summer make. However, by surveying Trollope's fiction, I can demonstrate that epistolarity is a basic important component of Trollope's story-telling art, and that his handling of it distinguishes him from other Victorian novelists. This requires not only looking at the art inside the mini-genre we call a letter whereby Trollope develops conversational styles which make us feel we are in a particular character's presence; I want also to discuss the inescapable elements which make up an epistolary situation. If we believe -- and I assume all of you here do believe -- that Trollope is one of the greatest nineteenth century novelists, it seems incumbent upon us to ask what he does better than most of his contemporaries, what he does that they don't do? One thing he does is use letters as a narrative medium on their own and woven into a nuanced omniscient narrative, and he makes these letters and partly epistolary narratives central to his stories. This combined texture allows us to observe terrains in his characters' minds which actuate real people's behaviour in life. The outward behaviour a written letter provokes provides Trollope with a graphic and striking means of dramatising the real constraints of our lives. It has often been remarked that novelists who use letters are themselves people who remain apart from others, who have had to work at integrating themselves into their society. In his Autobiography Trollope shows us he was such a man. Contemporary descriptions of him reveal a man who was not comfortable when in company, who would behave in ways that startled people. All his life he spent an enormous number of his waking hours apart from other people reading or absorbed in writing. He would be fascinated by the ways in which letters enable people to commune with one another while they remain physically apart; his customary destruction of all the private letters he received suggests a man acutely aware of how their documentary nature can be exploited. In his Autobiography Trollope also separates himself from the mystification by which theorists or the learned seek to raise their status; in his private letters he approaches his art pragmatically. Trollope's review of an abridgement of Samuel Richardson's million word epistolary novel, Clarissa shows he had read the whole thing previously, and had considered how to use epistolary narrative to make it appeal to nineteenth-century English readers. The first phase of Trollope's use of letters runs from The Macdermots of Ballycloran (1843-45) through to The Bertrams (1858). The most important developments in Trollope's epistolary technique occur towards the end of these fifteen years. In his first five novels, The Macdermots, The Kellys and O'Kellys, La Vend�e, The Warden and Barchester Towers, when Trollope writes an imaginary letter or note, he drops it in. His narrator stops moving forward chronologically. Reasons for the existence of the letter are adduced. It is inserted. The narrator guides our responses to it by interpreting it for us explicitly just before, during or after the letter closes. Omniscient narration resumes. When it is a letter which we must know about but which will not be included, we are given in lieu of it a brief description, a quotation or two which conveys its gist, or a very brief paraphrase dominated by a style and tone associated with the stance of our story-teller in the particular book. In Trollope's first five novels, letters are typically acts of friendship. They serve to unite the absent writer with the recipient on the basis of common shared values, of some service done, or of reciprocating thoughts in the form of information the writer knows his recipient will be interested to hear, help offered, advice, kind words or expressions of love. Examples: Mr Harding to Bishop Grantly in which he tells the Bishop those feelings he has which he hopes will make the Bishop sympathise with his decision to give up the Wardenship and reassure him that he and his daughter, Eleanor, will still have his income as precentor to rely upon (The Warden 19). In The Kellys and O'Kellys three letters by Walter ('Dot') Blake, sportsman, gambler, and expert horseman, to his patron, Francis O'Kelly, Lord Ballindine. In these Blake tells Ballindine how wonderfully well their shared horse is performing and how much money they are making; Dot also urges Ballindine to woo the book's rich heiress, Fanny Wyndham (Kellys 26, 34, 39). An example: over one-third of Miss Mackenzie (1864), is derived from variously hypocritical, bullying and quasi-spiteful love and business letters. The plain, thirty-four year old and hitherto lonely and isolated Miss Margaret Mackenzie has inherited from her unmarried brother a fortune which provides her with a yearly income of �800. Through four long letters a group of crassly self-interested suitors woo, pressure and lie to her. She writes two letters which fend off two of these men; in a third, she hides from her lawyer the reality that, driven by his needs and ambition, her married brother has mismanaged her money (1, 10, 15, 19, 23, 27). These seven letters are embedded in scenes of misreading and overreaction. Late in the novel, just in the manner of Mr Harding, Margaret and her most honest suitor, John Ball, suffer exquisite mortification and distress when one of the rejected suitors, the Rev. Jeremiah Maguire, manages to expose his version of the sordid dealings that have gone on in a series of letters to the Christian Examiner. The narrator explains to us why such material gets published: 'the very strong and one sided religious convictions' of the editors and readers of such newspapers enable them to justify to themselves such 'personal, heavy, biting and scorching attacks' (24). In response, Adela tells Caroline that she has misunderstood both George's and Harcourt's motives. George is deeply in love with Caroline, and Harcourt has been manipulating their conflicts. Caroline has acted wrongly -- and unwisely. Adela excuses herself for not sympathising with Caroline's point of view by labelling her reply 'savage'; however, her tender tones bely her self-accusation: 'I fear I have written savagely. Dear, dear Caroline, come to me here, and I will not talk savagely. I too am not happy'. People respond more to the tone of a letter than its content: Caroline is not hurt. The cruel nervous humour of this third sequence of letters distinguishes it from similar self-parodic letters in Trollope's earlier books. The effect of these earlier letters, for example, those by 'Screwy' (Verax Corkscrew, a clerk in the Internal Navigation Office) or Abraham Mollett (a blackmailer's doubledealing son) is poignant ironic comedy. Since these earlier letters are transparently hypocritical, written by weak people, and read by calm strong characters (The Three Clerks 18; Castle Richmond 39). In contrast, Bozzle is simply candid and speaking accurate truths about the hidden nature of sexual experience which is what torments Louis. Bozzle knows -- as do we all -- 'There is things, Mr Trewillian, one can't see' (19, 23). Bozzle's zeal does not provoke hilarity so much as unease because we read it through Louis's increasingly paralysed despair as he finds that he sees himself and Emily in the way that Bozzle sees them (45). Hugh Stanbury, Trevelyan's friend, tells Louis he should destroy such letters unread. Louis cannot. Since it would justify Louis's behaviour, Louis longs for the information that will destroy him (38). The second phase of Trollope's epistolarity runs from the year and one-half in which Trollope produced two novels at once, Castle Richmond and Framley Parsonage (1859-60) and began his first blockbuster masterpiece, Orley Farm (1860-61). It ends with Lady Anna, written twelve years later. In Castle Richmond and Orley Farm Trollope initiates, picks ups threads of his stories, sustains, drops and resumes them again by presenting what happened since we last left off through dialogues between inserted and interwoven letters (e.g, Castle Richmond 5, 15, 37; Orley Farm 4, 11, 21). In and after Framley Parsonage Trollope knits his stories together through correspondences between characters (Framley Parsonage 4-5, 21, 32). 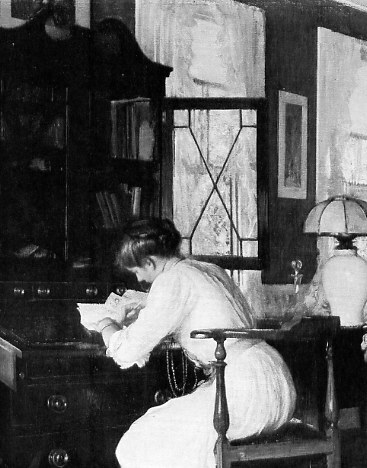 From The Three Clerks on, without their letters, Trollope's novels would be disconnected fragments; however, by the time of The Vicar of Bullhampton and Sir Harry Hotspur (both written in 1868), characters who live apart write one another at regular intervals and always at meaningful turning points in their lives (of which they seem to have very many). In the middle phase of Trollope's epistolarity, it is almost true to say, a reader can get the gist of all that has happened of importance in a Trollope novel just by reading its letters and semi-epistolary narratives in a row, and skipping over everything else. I have some numbers. The Bertrams is the first novel to show the exponential growth in the number of letters per novel which resulted when Trollope began to weave bits of letters and paraphrases from them into his earlier plain omniscient narratives. There are four letters in The Macdermots, ten in The Kellys and O'Kellys, one in La Vend�e, and six in The Warden. Barchester Towers is the first of Trollope's novels in which correspondences are casually referred to. Nevertheless, since these are few, brief and do not carry any of the novel's events, we may still count eighteen letters. Dr Thorne returns us to enumerable letters: there are thirteen. In The Three Clerks although Gertrude 'in continuation' to her family is an indeterminate correspondence, we can otherwise also count thirteen imaginary letters. There are in The Bertrams forty-nine individual letters, and epistolarity is no longer a matter of discrete units separable from the rest of the book: the narrator describes five different sets of correspondences, and he carefully characterises and paraphrases two more series of letters by two writers because they figure centrally in part of the novel's action. In The Bertrams we also find for the first time that curiosity which occurs repeatedly in Trollope's fiction after it: the letter a character attempts to write, meditates passages of, but fails to put on paper. Johnny Eames is one of Trollope's later characters who dreams his thoughts as letters he might write (The Small House 14; The Last Chronicle, 35). There are exceptions to Trollope's epistolary fecundity. Sir Harry Heathcote of Gangoil (1873) contains no letters at all. With some exceptions, there are few letters in Trollope's short stories and these letters are brief. The stories typically present characters who live in close proximity or whose culture does not encourage letter-writing -- or, Trollopian thought, their Post Office is inadequate. The many sets of letters in The Eustace Diamonds begin after Trollope has slowly built up the several interlocking stories, and the reader is thoroughly absorbed in the fiction. By the opening of the fourth instalment of The Eustace Diamonds, Lizzie Greystock, Lady Eustace's adventures with lawyers, alienation from her relatives and friends, and engagement to Lord Fawn climax for the moment in a series of minimally polite business and false letters of friendship (5, 10). It is then that Trollope's second story begins, dramatically, with a letter dated midnight Saturday, when 'all among my books and papers' and battle-weary barrister, Frank Greystock, asks the penniless governess Lucy Morris to marry him (13). The story of Frank and Lucy's protracted engagement is almost wholly carried on through letters. Its action is what happens in the minds of the characters as a result of reading their letters. Trollope's third phase begins three years after 'The Spotted Dog': from The Way We Live Now (1873) through to An Old Man's Love (1882), a river of only partly amused grief runs through Trollope's fictions. Lady Anna heralds and The Way We Live Now makes plain a change in the stance of Trollope's novels. Until The Way We Live Now in Trollope's fiction, except for rare instances of villainy, his narrator remains detached from the values of the characters while attempting to make us sympathise with them. With The Way We Live Now, Trollope's fiction turns satiric in outlook: a kind of steely self-distancing pervades the later books; Trollope's narrator no longer works to make us like the characters -- though he may urge us to identify with them nonetheless. Again I am talking about a general tendency or dominating trend. Things are not so bad in The Duke's Children (1876). While the Duke writes letters in order forever to cut himself off from other people (12, 51), other characters write letters in order to reconsider their alienation from, or humanely to inspirit one another (15, 22, 42, 50, 56, 60). In John Caldigate (written in the following year) alienated characters come together through writing because what irritated and got in the way of a friendship between two characters when they lived together does not seem so important as the relationship now that they are parted (13, 43, 45). Ayala's Angel (1878) contains many well-meaning letter-writers and recipients. The subject of the next long novel begun in the same year, Marion Fay -- the death of a young Quaker woman from tuberculosis -- occasions poignant letters in which Marion pours out the perplexities of a young woman under pressure to marry someone just as she lays dying (48, 55-56, 59, 62). Trollope's later novels are not comfortable books; in them letters show us characters mangling one another or themselves out of their need for and fear of one another. In its use of letters The American Senator (1875) typifies his later years. The 'Rufford Correspondence' includes a series of letters written by Lord Rufford, the wealthiest and in the town of Dillsborough (or for him by his brother-in-law, Sir George Penwether) to Arabella Trefoil, a penniless aging niece to an Earl, who wants to marry Lord Rufford. This correspondence is interwoven with another between Arabella and John Morton, a diplomat, who while less wealthy than Rufford, actually wants to marry Arabella. About two weeks pass before Arabella receives Rufford's wary reply: he affects insouciance and writes that after all, he might not show at Mistletoe; if not, he will of course send Jack. This reply is 'quite terrible' to Arabella: such words to her are cruelly teasing. She lets down her guard a bit and writes that Rufford can have no idea what she have gone through to arrange to visit Mistletoe. She calls him unkind and ungentlemanly: 'Please, please come' (31). The narrator tells us that Rufford understands what is happening as well as Arabella when Rufford writes: 'Dear Miss Trefoil, -- You shan't be disappointed, whether it be Jack or any less useful animal that you wish to see' (31). Trollope numbers these five letters for us because the next chapter reveals that just at the time that Arabella received Lord Rufford's first letter, she also received from John Morton a serious, long and somewhat affectionate letter. Morton asked Arabella if she 'is ready to declare herself his affianced wife before all the world'. We observe -- as John Morton and Rufford cannot -- the exact circumstances and criss-crossing letters which prompted Arabella to write each of her letters. While Arabella waits for Rufford's response to her plea, she doesn't reply to Morton's first. So Morton writes again 'severely, pressing her to reply', but when Rufford's wary jeer intervenes, she decides she had better not break her engagement to Morton so she writes a weaseling letter. Trollope's blend of free indirect speech, paraphrase, and quotation reminds us to read this letter from Morton's point of view as well as our own (32). But she 'collects her courage' and makes that last entreating plea to Rufford which is momentarily successful. Trollope twice uses epistolary rearrangement to climax these two chapters on Arabella's switch from Morton to Rufford in order to place before us how much this woman's stubborn resistance against accepting a lower and less exciting place in her society costs her, how much mortification and punishment she is willing to take. Since Trollope tells this story through inserted letters, interwoven redactions of letters, and acts of reading and writing we experience how easy it is to be duped by others because nothing can begin to capture all that happens in human minds which leaves no discernible trace. In The American Senator letters are also used to expose the economic and social antagonisms of its human communities. The letters of the American senator of the book, Elias Gotobed, are essays, to his colleague in the American House of Representatives on American and English customs, manners and laws, which, especially on the way church incomes and offices are given out (29, 51), contain many of Trollope's views. At the same time, in Gotobed's correspondences with various individuals in Dillsborough, he functions exactly like the tactless na�f of satire: he is the candid outsider who places before everyone else a stark assessment of the relationships they have with one another in terms of who gets what and who is being had, without worrying whose venality, hypocrisy or indifference to other people he exposes (3-4, 16, 19, 41, 77-78). 'I shall be delighted to save the life of so good a man on such easy terms' ... Then and there, with a pencil, on the back of an old letter, he wrote a line to Larry asking him to shoot on next Saturday, and dine with him afterwards at the Bush' (45). I began this talk by asking what does Trollope do that his contemporaries don't do. My answer has been that he makes a perceptive use of all a letter's characteristics as these are experienced in society. He is also innovative in his skillful compression of free indirect speech, redactions of letters, and acts of reading and writing within a omniscient narrative made subjective by an active story-teller's consciousness. I think it significant that Trollope never makes the mistake many fiction-writers have made ever since people first began to write long prose stories and divide these up into parts. He never uses the label letter for chapters of stories written in the first-person. Trollope calls letters only those texts which are written with imagined readers in mind -- and to the moment. The continuous psychological suspense of his books partly derives from his understanding of what a letter represents. In the book I wrote for this society I had an unexpected experience: I discovered that Trollope's illustrators repeatedly depict his characters hunched over their desks writing or bent over their letters reading them. * Julius Gari Melcheers was "born in Detroit in 1860, of Dutch parents. He studied in Paris, then continued his career in Germany, Holland, and the United States. He was made chevalier of the Legion of Honor in 1896, and won the Carnegie Prize in 1927." The picture is intended to be read as about a deserted wife. I have taken this information and the detail of a full picture from How the Rich Lived: The Painter as Witness: 1870-1914 by Edward Lucie Smith and Celestine Dars. Frome, England and Canada: Paddington, 1976, Plate 43, p. 238.